The Catholic Church holds that faith in Jesus Christ is not saving faith unless it bears fruit in good works. Vice-versa, the Church holds that such works are so intimately joined to faith, that, without them, it is impossible for the believer to grow or persevere in his faith.1 In this way, good works are necessary for salvation. Most Protestants are uncomfortable with such a statement. Without denying the importance of good works, Protestants tend to see them as symptoms of the one thing necessary rather than as necessities in their own right. For Luther, good works were merely symptoms of confident faith; for Calvin, they were symptoms of irresistible grace. Few Protestants today are familiar with the details of Luther’s or Calvin’s personal thought; what they have inherited from these great forebearers is rather a general orientation, whose core is the conviction that according to St. Paul, we are justified sofa fide (by faith alone) or sola gratia (by grace alone), either formula being understood to exclude any essential role of good works. A second stage is the very transition from death to life, which is the first stage of justification proper. Here the parties are at one in saying “sola fide,” though they seem to mean different things by it. Protestants tend to mean that, at this stage, by the grace of God, man’s act of faith is the sole act required of him; Catholics mean that faith is the beginning, foundation and root of all justification, since only faith makes possible the acts of hope and charity (i.e. love-for-God) which are also required.3 However, since most Protestants have a broad notion of the act of faith, whereby it includes elements of hope and love, it is often hard to tell how far the difference on this point is real and how far it is a matter of words. Finally, however, there comes a third stage, that of actual Christian life, with its problems of growth and perseverance. The man justified by faith is called to “walk” with God, to progress in holiness. It is at this stage that the parties sharply diverge. Catholics affirm, and Protestants strenuously deny, that the born-again Christian’s good works merit for him the increase of grace and of the Christian virtues. As a result, Protestant piety has no obvious place for the self-sacrifices, fasts, and states of perfection which are prominent features of Catholic piety. What Catholics call “sanctifying grace” or “habitual grace” turns out to be a deeply mysterious entity: a quality of man which is a property of God. In order to cope with such an entity, one needs a sophisticated metaphysics of participation. The Church Fathers and their successors, the Scholastic Doctors, took the trouble to work out such a metaphysics because the existence of grace as a real entity in man—ontic grace—was and is the foundation, without which the whole Catholic understanding of justification makes no sense. 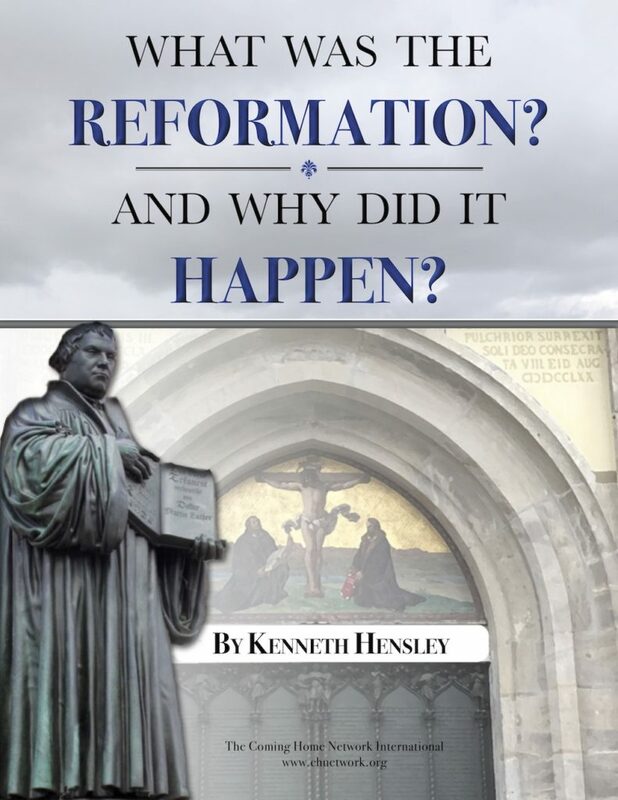 The Protestant Reformers, however, impatient with metaphysics, preferred not to cope with such an entity and denied its existence.4 To them it seemed simpler to say that grace is something wholly in God, namely, His favor towards us. But then, if grace is not something real in man, our “justification” can no longer be conceived as a real change in us; it will have to become a sheer declaration on God’s part, e.g. a declaration that, thanks to the work of Christ, He will henceforth consider us as just, even though we remain inwardly the sinners we always were. Hence, the Protestant doctrine of “forensic” or “extrinsic” justification. Now watch what happens to our own act of faith: it ceases to be the foundational act of an interior renewal and becomes a mere requirement, devoid of any salvific power in its own right, which God arbitrarily sets as the condition on which He will declare us just. Whereupon, watch what happens to our good works: they cease to be the vital acts wherein an ontologically real “new life” consists and manifests itself; they become mere human responses to divine mercy—nice, but totally irrelevant to our justification—or else they become zombie-like motions produced in us by irresistible divine impulses, whereby God exhibits His glory in His elect. St. Paul expounds and contrasts two economies of justification or two orders of righteousness. Thus, Philippians 3:9 says: “(I counted all things loss) that I might be found in Him, not having my own justice, which is from the Law, but the justice which is from the faith of Jesus Christ, the justice that comes from God through faith.” Here the main contrast is between justice from the Law and justice from faith, whereupon a second contrast emerges between my own justice and justice from God. We learn the result of this Jewish conduct in Romans 9:30-32, “What shall we say then? The gentiles, who were not pursuing justice, laid hold of justice, but the justice which is from faith. Israel, however, pursuing the law of justice, did not attain the law” (i.e. did not accomplish or fulfill it). The exact interpretation of this text has been debated,5 but for our purposes it suffices to see that Paul was speaking of a justice pursued by way of works and that such justice was the great ambition of the Jews in connection with the Law of Moses. The point that Mosaic legal justice was a matter of works reappears in Romans 10:5, quoting from Leviticus 18:5, in contrast with the justice from faith. The same is said in Galatians 3:12 (“But the law is not from faith; rather the one who does those things will live in them”) and in Romans 2:13 (“It is not the hearers of the Law who have been justified before God but the doers of the Law will be justified,” i.e. will be declared just at the last judgment), and this is expounded at length in Romans 2: 23-27. So, over against the justice of God, which is the justice of faith, there is a self-justice which is of the Law and which is a justice of works. This latter would give men a basis for boasting (Rom. 4:2, Eph. 2:8-9), since works give one a strict right to be considered just: “To the man who has works, his salary is not counted as a favor but as something due,” (Rom. 4:4). Now, as a matter of practical fact, does anyone really have this self-justice of Law and works? Over and over again Paul answers in the negative (cf. Rom. 3:20; 9:31-32; Gal. 3:10, quoting Deuteronomy 27: 26 and the context indicates that the curse has indeed gone into effect). To this day, the sad doctrine that our justification must be something merely declaratory has one of its most powerful roots in this fateful mistake: what St. Paul considered the paradigm experience of the Jew under the Law is confused with the paradigm experience of the Christian under the power of grace! And it is interesting to note that the revivalist wing of Protestantism tends to escape this mistake. Encountering Christ in deep experiences of conversion, they taste the power of His victory over sin in their own lives; having tasted it, they have not a doubt in the world that they have been changed inwardly, that God has given them new hearts, and that the nightmare experience of Romans 7 is over for them. Of course, the Christian can fall back into that nightmare. This is the grain of truth in St. Augustine’s later exegesis. In summary, then, what was wrong with the Jewish project to achieve righteousness from the Law is this: the project prescinded from God’s grace. Taken in abstraction from grace, the Law was powerless; destined to be disobeyed at least inwardly,6 the Law served to provoke and deepen sin. Though it may seem odd to summarize our discussion in that way, introducing suddenly the mention of grace, there is a reason for doing so. Romans 7, with its abstract dialectic of Law and sin, better self and concupiscence, has to be understood consistently with what St. Paul has already said in Romans 2. There he seems to treat the keeping of the commandments as a real possibility: “for when the gentiles, who do not have the Law, naturally do the things of the Law…”(Rom. 2:14). In fact, he says, “God will render to each man according to his works: eternal life to those who, dedicating themselves with perseverance to good works, seek glory, honor and immortality…glory honor and peace to all who do good, to the Jew first and to the Greek” (Rom. 2:7) and this in a context in which the revelation of Christ is not even under discussion yet. These words certainly show that St. Paul did not regard good works as impossible, misguided, or pernicious, as some Protestant exegetes have tried to hold. Quite the contrary. But if St. Paul seems to admit justifying works in Romans 2 and to exclude them in Romans 7, the most plausible explanation is that he is speaking of the total human condition in chapter 2, where grace is at work among Jew and gentile alike, whereas in chapter 7 he is showing what happens when the Law is isolated from grace. Such isolation is exactly what is sought, when man seeks his own righteousness on the basis of law. The Jewish project to seek one’s own justice from the Law was not only psychologically impossible (Rom. 7) but also contrary to the plan of the ages, in which the Law had no function but this: in leading us to Christ, to render itself obsolete. Now we can understand why Paul cried out in frustration at the obtuse Galatians: “If the Law can justify us, there is no point in the death of Christ” (Gal. 2:21). Let us examine that other kind of justice mentioned by Paul: the justice which comes from God through faith. “For in it (the Gospel) the justice of God is revealed from faith to faith, as it is written, ‘The just shall live from faith;” (Rom. 1:17). What is this justice “of God” (dikaiosune theou)? If the genitive is one of attribution, then what has been revealed is God’s own attribute rather than something He gives to men. Thus Origen7 and Pseudo- Ambrose.8 But if the genitive is one of source, then what is revealed is a justice conferred on men by God. Thus Chrysostom,9 Augustine,10 and most modern exegetes.11 What lends weight to the second interpretation is the fact that God’s own justice gets revealed precisely in His conferring justice on men, as Paul himself suggests: “so that He Himself might be just and render just the man who has faith in Jesus Christ” (Rom. 3:26). By contrast, Luther’s notion that “the justice of God” here refers to His vindictive action against sinners is totally unsupported either by the Fathers or by the modern scholars. The thought of Romans 1:17 is picked up again in Romans 3:21-22, and here there is no doubt that God’s justice is something which comes to men, is communicated to men. In this light, look again at a text we saw before: “[The Jews] not knowing the justice of God and seeking to establish their own justice, did not submit to God’s justice” (Rom. 10:3). We can now see that the contrast is not between God’s attribute and man’s achievement, but rather between something God communicates to man and something man tries to achieve on his own. Both pertain to man, and so, they are rivals. Now, we can begin to understand this “non-submission.” It was not the attitude of the true heroes of the Old Testament. Besides the example of Abraham, we have a whole catalogue of Jews who lived “by faith” in Hebrews 11, a document which, if not by Paul himself, was certainly written by someone intimately familiar with his thought. There is not time for me to give an account of Gideon, Barak, Samson, Jephthah, or of David, Samuel and the prophets. These men who through faith conquered kingdoms, did what is right and earned the promises (Heb. 11:32f). Now the key to these men, by virtue of which they are said to have lived “by faith,” is not that they did not do any works of the Law! Obviously. Rather, the key is that they lived in total dependence upon God’s promises, in total openness to what God would yet reveal. That is why there is no contradiction between their attitude and the surprising turn which revelation took in Jesus Christ. But the other and later Jews had so reduced faith to the keeping of the Law, that the Law could not be provisional; as a result, their whole attitude toward God was not one of expectant faith but one of satisfied accomplishment. So, when the justice that God had all along intended to confer upon man was revealed in Jesus the Servant-Messiah, they did not submit to it. Not so obtuse as Luther, they could see that this “justice of God” was means for them and so was a rival to the justice they already thought they had. And not so obtuse as the Galatians, they could see that if the Messiah’s death had a point to it, then the Law could not justify them. Now, if what Paul means by dikaiosune theou is not something to remain in God but something meant to be conferred on us, then we must reckon with that mysterious possibility: a quality of man which is the property of God. Does St. Paul say anything to indicate a knowledge of this possibility? Indeed he does: “God has made him who knew no sin to be sin for us, so that we in him might become justice of God” (2 Cor. 5:21). This verse is the pattern on which Athanasius would learn to say, “God became man, so that man might become divine.” It is not a question of replacement but of participation, and the participation is real in both directions. First in Jesus: just as really as the Word took our humanity, just that really his humanity became God. And then in us: just as really as Christ-God took our sins (so really that even the Father forsook Him—Mark 15:34), just that really we receive God’s justice. For if we dare to believe that in the Incarnation our nature, without ceasing to be a human nature, received God’s subsistence, then we may easily believe that we, in Christ, receive God’s justice as our quality. In fact, St. Paul even has a name for this quality. In the very next verse (2 Cor. 6:1) he says: “As God’s co-workers, we beg you once again not to have received God’s grace in vain.” What we should not “receive in vain” is exactly what Paul has just said we have “become” in Christ. God’s justice is His grace, a gift given to men. That is why the justice of God is identically “the justice which comes from God through faith” (Phil. 3:9). What emerges from these texts, then, is the existence in man of a justice conferred by God. But this justice is tied into faith, whether before Christ’s coming, as in the case of Abraham, or afterwards, as in our case. What we must explore next is the nature of this tie-in between justice and faith. Whoever shall call upon the name of the Lord shall be saved. But how shall they call upon one in whom they have not believed? And how shall they believe in one of whom they have never heard? And how shall they hear if no one preaches? And how shall anyone preach unless he has been sent…But not everyone has obeyed (hupekousan) the Gospel. As Isaiah said, ‘Lord, who has believed our report?’ So faith depends upon preaching and preaching upon the word of Christ. These texts indicate that what St. Paul called “faith” certainly included the scholastic sense of the term (assent or submission of the intellect to the truths taught by Christ to His Apostles, and by them to us, on the authority of God) but also included more. The reader should remember that the scholastic definition of ‘faith’ was designed to do a technical job, namely, to designate the common content of ‘living faith’ (fides caritate formata) and ‘dead faith’ (fides informis). It does this job very well; the common content is intellectual assent to the revealed message. But St. Paul’s term ‘faith’ was used by him to designate man’s rightful response to Christ’s message. Now, where this message consists of truths of fact (e.g. “Before Abraham was, I am”; “I and the Father are one,” etc.) intellectual assent is all there is to the rightful response; but where the message contains imperatives (“Repent and be baptized”), consolations (“Fear not, I have overcome the world”), promises (“But I will see you again, and your heart shall rejoice”), examples (“When you pray, pray like this: Our Father…”) etc., there the rightful response is to do as one is commanded, take the consolation, trust the promise, heed the example and so forth. Indeed, to believe in a command intellectually and then not do it, to accept a consolation intellectually and then not feel it, to acknowledge a promise and then not trust it—these are even unnatural responses. “Dead faith” is an ugly thing—not just “unformed” but deformed by sin and shot-through with the self-contradiction which lies at the heart of every sin. We are now in a position to see the tie-in between faith and justice. Observe first of all how St. Paul expresses the connection in prepositions. He speaks of God’s “justice which is from (ek) faith” (Rom. 9:30; 10:6); he says we are “justified from faith” (Gal. 2:16; 3:24). So justice is distinct from faith; it proceeds from it. Justice has its source and point of departure in faith. However, lest we should get the idea that justice is a direct “output” of faith, or a natural derivative, it is vital to see that a divine action intervenes between faith and justice: “God justifies the Gentiles from faith” (Gal. 3:8,30; cf. Rom. 3:24). This divine action is highlighted by Paul’s other favorite preposition, the instrumental dia, through. “God’s justice is through faith” (Rom. 3:22; Phil. 3:9) “he justifies the gentiles through faith” (Rom. 3:30). These prepositions instruct us on how to take Paul’s meaning when he dispenses with prepositions in favor of a simple instrumental dative: “For we think that man is justified by faith” (Rom. 3:28); “through Him (Christ) we have access by faith” (Rom. 5:1). The meaning is the same as before. Faith remains God’s instrument in justifying, and not (as Luther supposed) man’s instrument in getting justified. Luther supposed that God took a thing of no real value (our faith) and made it stand for something of value. God doctored the Book of Life! Such an idea has no foundation in the text. The key verb here (logizomai) is used throughout the Septuagint (Psalm 106:31; Isa. 40:17), and even in Koine Greek, and in the New Testament (Acts 19:17), and even in St. Paul’s epistle to the Romans (2:26; 9:8), to mean an honest reckoning, based on a real equivalence of value between the two things. Nowhere does the crediting presuppose a disproportion between the thing furnished (e.g. faith) and the value put on it (e.g. justice). No, indeed; what Abraham’s faith is said to count for in Gen. 15:6 is the very thing which the keeping of the Law is said to count for in Deuteronomy 6:25 and 24:13. Living faith is worth righteousness. Yes, but not in the way that works are worth it. To the one who works, his wages are not credited to him according to grace but according to what is owed. But to the one who does not work but believes in Him who justifies the wicked, his faith is credited to him for righteousness. So, if faith is really worth righteousness, it is not worth it in the way that works are. The latter have their value in the order of strict justice, whereas faith has its value in the order of grace (kata charin). Does it follow, then, that the order of grace is arbitrary, unreal, an order in which the worthless is accorded fictitious worth? Not at all! We have seen what living faith really is. It is that rightful response to the Gospel, whereby man assents to the truths, heeds the commands, feels the consolations, trusts the promises—in short, it is that total attitude toward God from which (as from a source) or through which (as by a means) God can draw forth every good work with the further help of His actual graces. Between such faith as a basis and the “measure of the stature of the fullness of Christ” as an apex, there is a real continuity and proportion. That is why God can use faith to justify us, and why He can, without dishonesty, credit that faith to our account as the root and foundation of all justice. For as St. Paul himself says, in a verse which ought to have stopped the mouth of Luther forever, “We are God’s handiwork, having been created in Christ Jesus to do good works, which God prepared beforehand that we should walk in them” (Eph. 2:10). Our new creaturehood in Christ Jesus is our reception, through grace, of the “obedience of faith.” Through that faith, as through an instrument, God has refashioned us, making us now prompt to obey. Our new estate is thus ordered to good works as to its intrinsic and God-intended finality. With what joy, therefore, do we walk in them, we who believe! And woe to us if we do not walk in them, for then we betray our faith and frustrate God’s handiwork. So we have, and are intended to have, works. Does it follow that we may boast? Not at all! For our works, unlike the works attempted by the Jew under the Law, are not from us but from God. Rooted in God’s gift, brought forth by living faith, God’s instrument in us, these works are grace-works. They are our justice through faith, and therefore they are justice in the order of grace (kata charin), not in the order of self-achievement where boasting arises. Living faith: our quality but God’s instrument; good works: our deeds but God’s handiwork; our deeds as men living in Christ, not the motions of “graced” zombies still dead in sin—these are the possibilities overlooked by Luther and Calvin but preached by Paul and defined by Trent. 1 Council of Trent, Canons on Justification, especially canon 24; Denzinger- Schoenmetzer # 1574. The Church considers herself bound to this position by James 2:14-26. 2 The teaching of the Second Council of Orange is given in Denzinger # 374ff. and that of Trent in #1553. To say that, prior to a person’s conversion (or baptism), his or her “good deeds” may merit God’s grace is Pelagianism or worse; even to say that man has the initiative in this preparatory stage, or that his first response of faith is his own free motion, his own step towards the grace of God and not already an effect of the grace of God, is a heresy (Semi-Pelagianism). 3 Trent, Decree on Justification, chapter 8 (Denz. # 1532), and canon 9 (Denz. 1559). 4 See the magnificent discussion in Louis Bouyer, The Spirit and Forms of Protestantism (Westminster: Newman Press) 1956. 5 Compare the view of St. John Chrysostom, Patrologia Graeca (hereafter=PG) 60, col. 563, with that of Aquinas, In epistolam ad Romanos, c.9, lect 5 in fine. 6. I say “at least inwardly” because, as far as public and merely external observations are concerned, Paul concedes that he himself was blameless: Philippians 3:6. See Aquinas’s comment, In ep. Ad Phil. c. 3, lect. 2. 7 PG 14, col, 861. 8 Patrologia latina (hereafter PL) 17, col, 56. 9 PG 60, col, 409. 10 PL 44, col 211. 11. Cf. Sanday-Headlam, Commentary on the Epistle to the Romans (IGC) p. 25. 12 For the same indifference between ‘faith’ and ‘obedience,’ compare Rom. 10:16 with 2 Thess. 3:2. 13 See how the acts called hope and love are founded on intellectual assent (otherwise I wouldn’t even acknowledge the command or the promise, etc.) but add to it in such a way that the assent becomes the loving assent of the whole man. This is why Trent, using ‘faith’ in the narrow sense, was right to say both that faith is the root and foundation of all justification and that faith is made living by hope and love. Born in 1943 and raised in the Lutheran Church, Professor Marshner pursued graduate studies at Yale University, attained the S.T.D. from the John Paul II Intstitute, and is now the chairman of the Theology Department at Christendom College. This article is excerpted from Appendix 4 of “Reasons for Hope,” published by Christendom Press.